This article is about the Native American woman. For the Hewlett-Packard processor, see HP Sacajawea. For the coin, see Sacagawea dollar. Sacagawea (/səˌkɑːɡəˈwiːə/; also Sakakawea or Sacajawea; May 1788 – December 20, 1812) was a Lemhi Shoshone woman who is known for her help to the Lewis and Clark Expedition in achieving their chartered mission objectives by exploring the Louisiana Territory. She was inducted into the National Women's Hall of Fame in 2003. Sacagawea is known to have been an important member of the Lewis and Clark expedition. The National American Woman Suffrage Association of the early twentieth century adopted her as a symbol of women's worth and independence, erecting several statues and plaques in her memory, and doing much to spread the story of her accomplishments. In 1977, she was inducted into the National Cowgirl Hall of Fame in Fort Worth, Texas. In 2001, she was given the title of Honorary Sergeant, Regular Army, by then-president Bill Clinton. Reliable historical information about Sacagawea is very limited. She was born into an Agaidika (Salmon Eater) of Lemhi Shoshone tribe between Kenney Creek and Agency Creek near Salmon, Idaho, in Lemhi County. In 1800, when she was about twelve years old, she and several other girls were kidnapped by a group of Hidatsa in a battle that resulted in the deaths of several Shoshone: four men, four women, and several boys. She was held captive at a Hidatsa village near present-day Washburn, North Dakota. At about age thirteen, Sacagawea was sold into a nonconsensual marriage to Toussaint Charbonneau, a Quebecois trapper living in the village. He had also bought another young Shoshone, known as Otter Woman, as his wife. Charbonneau was variously reported to have purchased both girls to be his wives from the Hidatsa or to have won Sacagawea while gambling. Sacagawea was pregnant with her first child when the Corps of Discovery arrived near the Hidatsa villages to spend the winter of 1804–05. Captains Meriwether Lewis and William Clark built Fort Mandan. They interviewed several trappers who might be able to interpret or guide the expedition up the Missouri River in the springtime. They agreed to hire Charbonneau as an interpreter because they discovered his wife spoke Shoshone, and they knew they would need the help of Shoshone tribes at the headwaters of the Missouri. Charbonneau and Sacagawea moved into the expedition's fort a week later. Clark nicknamed her "Janey. "[b] Lewis recorded the birth of Jean Baptiste Charbonneau on February 11, 1805, noting that another of the party's interpreters administered crushed rattlesnake rattles to speed the delivery. Clark and other European Americans nicknamed the boy "Little Pomp" or "Pompy." In April, the expedition left Fort Mandan and headed up the Missouri River in pirogues. They had to be poled against the current and sometimes pulled from the riverbanks. On May 14, 1805, Sacagawea rescued items that had jumped out of a capsized boat, including the journals and records of Lewis and Clark. The corps commanders, who praised her quick action, named the Sacagawea River in her honor on May 20, 1805. By August 1805, the corps had located a Shoshone tribe and was attempting to trade for horses to cross the Rocky Mountains. They used Sacagawea to interpret and discovered that the tribe's chief, Cameahwait, was her brother. Lewis and Clark reach the Shosone camp led by Sacagawea. Shortly after Capt. Clark arrived with the Interpreter Charbono, and the Indian woman, who proved to be a sister of the Chief Cameahwait. The meeting of those people was really affecting, particularly between Sah cah-gar-we-ah and an Indian woman, who had been taken prisoner at the same time with her, and who had afterwards escaped from the Minnetares and rejoined her nation. The Shoshone agreed to barter horses to the group, and to provide guides to lead them over the cold and barren Rocky Mountains. The trip was so hard that they were reduced to eating tallow candles to survive. When they descended into the more temperate regions on the other side, Sacagawea helped to find and cook camas roots to help them regain their strength. As the expedition approached the mouth of the Columbia River on the Pacific Coast, Sacagawea gave up her beaded belt to enable the captains to trade for a fur robe they wished to give to President Thomas Jefferson. When the corps reached the Pacific Ocean, all members of the expedition—including Sacagawea and Clark's black manservant York—voted on November 24 on the location for building their winter fort. In January, when a whale's carcass washed up onto the beach south of Fort Clatsop, Sacagawea insisted on her right to go see this "monstrous fish." On the return trip, they approached the Rocky Mountains in July 1806. On July 6, Clark recorded "The Indian woman informed me that she had been in this plain frequently and knew it well ... She said we would discover a gap in the mountains in our direction ..." (which is now Gibbons Pass). A week later, on July 13, Sacagawea advised Clark to cross into the Yellowstone River basin at what is now known as Bozeman Pass. Later, this was chosen as the optimal route for the Northern Pacific Railway to cross the continental divide. 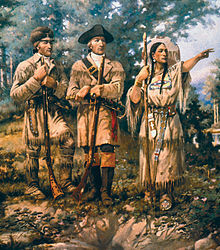 While Sacagawea has been depicted as a guide for the expedition, she is recorded as providing direction in only a few instances. Her work as an interpreter certainly helped the party to negotiate with the Shoshone; however, her greatest value to the mission may have been simply her presence during the arduous journey, which demonstrated the peaceful intent of the expedition. While traveling through what is now Franklin County, Washington, Clark noted, "The Indian woman confirmed those people of our friendly intentions, as no woman ever accompanies a war party of Indians in this quarter," and, "the wife of Shabono our interpeter we find reconsiles all the Indians, as to our friendly intentions a woman with a party of men is a token of peace." After the expedition, Charbonneau and Sacagawea spent three years among the Hidatsa before accepting William Clark's invitation to settle in St. Louis, Missouri, in 1809. They entrusted Jean-Baptiste's education to Clark, who enrolled the young man in the Saint Louis Academy boarding school. Sacagawea gave birth to a daughter, Lizette, sometime after 1810. An 1811 journal entry made by Henry Brackenridge, a fur dealer at Fort Manuel Lisa Trading Post on the Missouri River, stated that, both, Sacagawea and Charbonneau were living at the fort. He recorded that Sacagawea "...had become sickly and longed to revisit her native country." The following year, John Luttig, a clerk at Fort Manuel Lisa, recorded in his journal on December 20, 1812, that: "...the wife of Charbonneau, a Snake Squaw [the common term used to denote Shoshone Indians], died of putrid fever." He went on to say that she was "aged about 25 years. She left a fine infant girl". Documents held by Clark show that her son Baptiste already had been entrusted by Charbonneau into Clark's care for a boarding school education, at Clark's insistence (Jackson, 1962). A few months later, 15 men were killed in an Indian attack on Fort Lisa, then located at the mouth of the Bighorn River. John Luttig and Sacagawea's young daughter were among the survivors. Toussaint Charbonneau was mistakenly thought to have been killed at this time, but he apparently lived to at least age 76. He had signed over formal custody of his son to William Clark in 1813. An adoption document made in the Orphans Court Records in St. Louis, Missouri, states, 'On August 11, 1813, William Clark became the guardian of 'Tousant Charbonneau, a boy about ten years, and Lizette Charbonneau, a girl about one year old.' For a Missouri State Court at the time, to designate a child as orphaned and to allow an adoption, both parents had to be confirmed dead in court papers. The last recorded document citing Sacagawea's existence appears in William Clark's original notes written between 1825 and 1826. He lists the names of each of the expedition members and their last known whereabouts. For Sacagawea he writes: "Se car ja we au— Dead." (Jackson, 1962). Some American Indian oral traditions relate that rather than dying in 1812, Sacagawea left her husband Charbonneau, crossed the Great Plains, and married into a Comanche tribe. She was said to have returned to the Shoshone in Wyoming in 1860, where she died in 1884. Interest in Sacajawea peaked and controversy intensified when Dr. Grace Raymond Hebard, professor of political economy at the University of Wyoming in Laramie and an active supporter of the Nineteenth Amendment, campaigned for federal legislation to erect an edifice honoring Sacajawea's death in 1884. In 1925, Dr. Charles Eastman, a Dakota Sioux physician, was hired by the Bureau of Indian Affairs to locate Sacagawea's remains. Eastman visited many different Native American tribes, to interview elderly individuals who might have known or heard of Sacagawea, and learned of a Shoshone woman at the Wind River Reservation with the Comanche name Porivo (chief woman). Some of the people he interviewed said that she spoke of a long journey wherein she had helped white men, and that she had a silver Jefferson peace medal of the type carried by the Lewis and Clark Expedition. He found a Comanche woman called Tacutine who said that Porivo was her grandmother. She had married into a Comanche tribe and had a number of children, including Tacutine's father Ticannaf. Porivo left the tribe after her husband Jerk-Meat was killed. According to these narratives, Porivo lived for some time at Fort Bridger in Wyoming with her sons Bazil and Baptiste, who each knew several languages, including English and French. Eventually, she found her way back to the Lemhi Shoshone at the Wind River Indian Reservation, where she was recorded as "Bazil's mother". This woman, Porivo is believed to have died on April 9, 1884. It was Eastman's conclusion that Porivo was Sacagawea. In 1963, a monument to "Sacajawea of the Shoshonis" was erected at Fort Washakie on the Wind River reservation near Lander, Wyoming, on the basis of this claim. The belief that Sacagawea lived to old age and died in Wyoming was widely disseminated in the United States in the biography Sacajawea (1933) by University of Wyoming professor and historian Grace Raymond Hebard. Critics have called into question Hebard's 30 years of research, which led to the biography of the Shoshone woman. Hebard presents a stout-hearted woman in her portrayal of Sacajawea that is "undeniably long on romance and short on hard evidence, suffering from a sentimentalization of Indian culture". Sacagawea gave birth to a daughter, Lizette Charbonneau, sometime after 1810. However, there is no later record of Lizette among Clark's papers. It is believed that she died in childhood. Sacagawea's son Jean Baptiste Charbonneau continued a restless and adventurous life. He carried lifelong celebrity status as the infant who went with the explorers to the Pacific Ocean and back. When he was 18, he was befriended by a German Prince, Duke Paul Wilhelm of Württemberg, who took him to Europe. There, Jean-Baptiste spent six years living among royalty, while learning four languages and fathering a child in Germany named Anton Fries. After his infant son died, Jean-Baptiste came back from Europe in 1829 to live the life of a Western frontiersman. He became a gold miner and a hotel clerk and in 1846 led a group of Mormons to California. While in California he became a magistrate for the Mission San Luis Rey. He disliked the way Indians were treated in the Missions and left to become a hotel clerk in Auburn, California, once the center of gold rush activity. After working six years in Auburn, the restless Jean-Baptiste left in search of riches in the gold mines of Montana. He was 61 years old, and the trip was too much for him. He became ill with pneumonia and died in a remote area near Danner, Oregon, on May 16, 1866. A long-running controversy has surrounded the correct spelling, pronunciation, and etymology of the woman's name; however, linguists working on Hidatsa since the 1870s have always considered the name's Hidatsa etymology essentially indisputable. The name is a compound of two common Hidatsa nouns, cagáàga [tsakáàka] 'bird' and míà [míà] 'woman'. The compound is written as Cagáàgawia 'Bird Woman' in modern Hidatsa orthography, and pronounced [tsakáàkawia] (/m/ is pronounced [w] between vowels in Hidatsa). The double /aa/ in the name indicates a long vowel and the diacritics a falling pitch pattern. Hidatsa is a pitch-accent language that does not have stress; therefore, in the Hidatsa pronunciation all syllables in [tsaɡáàɡawia] are pronounced with roughly the same relative emphasis. However, most English speakers perceive the accented syllable (the long /aa/) as stressed. In faithful rendering of the name Cagáàgawia to other languages, it is advisable to emphasize the second, long syllable, not the last, as is common in English. Sacagawea /səˌkɑːɡəˈwiːə/ is the most widely used spelling of her name, and is pronounced with a hard "g" sound, rather than a soft "g" or "j" sound. Lewis and Clark's original journals mention Sacagawea by name seventeen times, spelled eight different ways, each time with a "g". Clark used Sahkahgarwea, Sahcahgagwea, Sarcargahwea, and Sahcahgahweah, while Lewis used Sahcahgahwea, Sahcahgarweah, Sahcargarweah, and Sahcahgar Wea. The spelling Sacagawea was established in 1910 as the proper usage in government documents by the United States Bureau of American Ethnology, and is the spelling adopted by the United States Mint for use with the dollar coin, as well as the United States Board on Geographic Names and the U.S. National Park Service. The spelling is used by a large number of historical scholars. a handsome river of about fifty yards in width discharged itself into the shell river ... this stream we called Sah-ca-gah-we-ah or bird woman's River, after our interpreter the Snake woman. Sakakawea is the official spelling of her name according to the Three Affiliated Tribes, which include the Hidatsa, and is widely used throughout North Dakota (where she is considered a state heroine), notably in the naming of Lake Sakakawea, the extensive reservoir of Garrison Dam on the Missouri River. Her Hidatsa name, which Charbonneau stated meant "Bird Woman," should be spelled "Tsakakawias" according to the foremost Hidatsa language authority, Dr. Washington Matthews. When this name is anglicized for easy pronunciation, it becomes Sakakawea, "Sakaka" meaning "bird" and "wea" meaning "woman." This is the spelling adopted by North Dakota. The spelling authorized for the use of federal agencies by the United States Geographic Board is Sacagawea. Although not closely following Hidatsa spelling, the pronunciation is quite similar and the Geographic Board acknowledged the name to be a Hidatsa word meaning "Bird Woman. ... the Sakakawea spelling similarly is not found in the Lewis and Clark journals. To the contrary, this spelling traces its origin neither through a personal connection with her nor in any primary literature of the expedition. It has been independently constructed from two Hidatsa Indian words found in the dictionary Ethnography and Philology of the Hidatsa Indians (1877), published by the Government Printing Office. Compiled by a United States Army surgeon, Dr. Washington Matthews, 65 years following Sacagawea's death, the words appear verbatim in the dictionary as "tsa-ka-ka, noun; a bird," and "mia [wia, bia], noun; a woman. The name Sacajawea or Sacajewea /ˌsækədʒəˈwiːə/, in contrast to the Hidatsa etymology, is said to be derived from Shoshone Saca-tzaw-meah, meaning "boat puller" or "boat launcher". It is the preferred spelling used by the Lemhi Shoshone people, some of whom claim that her Hidatsa captors merely reinterpreted her existing Shoshone name in their own language, and pronounced it in their own dialect – they heard a name that approximated "tsakaka" and "wia", and interpreted it as "bird woman", substituting the hard "g/k" pronunciation for the softer "tz/j" sound that did not exist in the Hidatsa language. The use of this spelling almost certainly originated from the use of the "j" spelling by Nicholas Biddle, who annotated the Lewis and Clark Expedition's journals for publication in 1814. 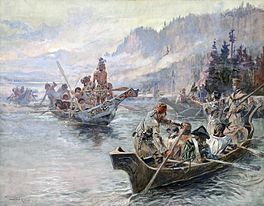 This use became more widespread with the publication of the 1902 novel The Conquest: The True Story of Lewis and Clark, written by Eva Emery Dye. It is likely Dye used Biddle's secondary source for the spelling, and her highly popular book made it ubiquitous throughout the United States (previously most non-scholars had never even heard of Sacagawea). Rozina George, great-great-great-great-granddaughter of Cameahwait, says the Agaidika tribe of Lemhi Shoshone do not recognize the spelling or pronunciation Sacagawea, and schools and other memorials erected in the area surrounding her birthplace use the spelling Sacajawea. The Lemhi Shoshone call her Sacajawea. It is derived from the Shoshone word for her name, Saca tzah we yaa. In his Cash Book, William Clark spells Sacajawea with a "J". Also, William Clark and Private George Shannon explained to Nicholas Biddle (Published the first Lewis and Clark Journals in 1814) about the pronunciation of her name and how the tz sounds more like a "j". What better authority on the pronunciation of her name than Clark and Shannon who traveled with her and constantly heard the pronunciation of her name? We do not believe it is a Minnetaree (Hidatsa) word for her name. Sacajawea was a Lemhi Shoshone not a Hidatsa. Idaho native John Rees explored the "boat launcher" etymology in a long letter to the United States Commissioner of Indian Affairs written in the 1920s; it was republished in 1970 by the Lemhi County Historical Society as a pamphlet entitled "Madame Charbonneau" and contains many of the arguments in favor of the Shoshone derivation of the name. The spelling Sacajawea, although widely taught until the late twentieth century, is generally considered incorrect in modern academia. Linguistics professor Dr. Sven Liljeblad from the Idaho State University in Pocatello has concluded that "it is unlikely that Sacajawea is a Shoshoni word. ... The term for 'boat' in Shoshoni is saiki, but the rest of the alleged compound would be incomprehensible to a native speaker of Shoshoni." The spelling has subsided from general use, although the corresponding "soft j" pronunciation persists in American culture. The artwork The Dinner Party by feminist artist Judy Chicago features a place setting for Sacagawea in Wing Three of the installation, titled American Revolution to the Women's Revolution. Some fictional accounts speculate that Sacagawea was romantically involved with Lewis or Clark during their expedition,[which?] however, while the journals show that she was friendly with Clark and would often do favors for him, the idea of a romantic liaison was created by novelists who wrote about the expedition much later. This fiction was perpetuated in the Western film The Far Horizons (1955). In her novel Sacajawea (1984), Anna Lee Waldo explored the story of Sacajawea's returning to Wyoming 50 years after her departure. The author was well aware of the historical research supporting an 1812 death, but she chose to explore the oral tradition. Several movies, both documentaries and fiction, have been made about, or featuring, Sacagawea. In 1967, the actress Victoria Vetri, under the name Angela Dorian, played Sacajawea in the episode "The Girl Who Walked the West" of the syndicated television series, Death Valley Days. Two early twentieth-century novels shaped much of the public perception of Sacagawea. The Conquest: The True Story of Lewis and Clark (1902), was written by American suffragist Eva Emery Dye and published in anticipation of the expedition's centennial. The National American Woman Suffrage Association embraced her as a female hero, and numerous stories and essays about her appeared in ladies' journals. A few decades later, Grace Raymond Hebard published Sacajawea: Guide and Interpreter of Lewis and Clark (1933) to even greater success. Sacagawea has since become a popular figure in historical and young adult novels, including Anna Lee Waldo's novel Sacajawea (1984). In Philip Glass's "Piano Concerto No. 2 after Lewis & Clark", the second movement is entitled "Sacagawea". Sacagawea is mentioned in the Schoolhouse Rock song "Elbow Room" as the guide for Lewis and Clark. Sacagewea is referenced in Stevie Wonder's song "Black Man", from the album Songs in the Key of Life (1976). Eric Tingstad & Nancy Rumbel's 1988 album Legends includes a piece entitled Sacajawea. In 2010, Italian pianist and composer Alessandra Celletti released Sketches of Sacagawea, a limited-edition tribute box set with an album and accompanying book, on Al-Kemi Lab. The first episode of the history podcast, The Broadsides, contains discussion of Sacagawea and her accomplishments during the Lewis and Clark Expedition. Sacagawea on US Dollar coin. Coin popularly known as Sacagawea dollar. In 2000, the United States Mint issued the Sacagawea dollar coin in her honor, depicting Sacagawea and her son, Jean Baptiste Charbonneau. Because no contemporary image of Sacagawea exists, the face on the coin was modeled on a modern Shoshone-Bannock woman named Randy'L He-dow Teton. The portrait design is unusual, as the copyrights have been assigned to and are owned by the US Mint. Therefore the portrait is not in the public domain, as most US coin designs are. Sacajawea Memorial Area, at Lemhi Pass, a National Historic Landmark managed by the National Forest Service and located on the boundary of Montana and Idaho, where visitors can hike the Lewis and Clark National Historic Trail. 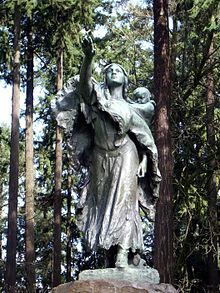 The Daughters of the American Revolution (DAR) created the memorial area in 1932 to honor Sacajawea for her role in the success of the Lewis and Clark Expedition. The Sacajawea Interpretive, Cultural, and Educational Center is a 71-acre (290,000 m2) park located in Salmon, Idaho, by the rivers and mountains of Sacajawea's homeland. It is "owned and operated by the City of Salmon, in partnership with the Bureau of Land Management, Idaho Governor's Lewis & Clark Trail Committee, Salmon-Challis National Forest, Idaho Department of Fish & Game, and numerous non-profit and volunteer organizations". Mobridge, South Dakota: The Sacagawea Monument is an obelisk erected at the supposed site of her death, which honors Sacagawea as a member of the Shoshone tribe and for her contribution to the Corps of Discovery expedition; the associated marker "dates her death as December 20, 1812 and states that her body must be buried somewhere near the site of old Fort Manuel located 30 miles north of the marker"
Wind River Indian Reservation, Wyoming: According to oral tradition, Sacagawea left her husband Toussaint Charbonneau an fled to Wyoming in the 1860s; her alleged burial site is located in the reservation's cemetery, with a gravestone inscription dating her death as April 9, 1884, however, oral tradition also indicates a woman named Porivo (recorded as "Bazil's mother") occupies that grave. ^ Journal entries by Clark, Lewis, et al., are brief segments of "our nation's 'living history' legacy of documented exploration across our fledgling republic's pristine western frontier. It is a story written in inspired spelling and with an urgent sense of purpose by ordinary people who accomplished extraordinary deeds." ^ William Clark created the nickname "Janey" for Sacagawea, which he transcribed twice, November 24, 1805, in his journal, and in a letter to Toussaint, August 20, 1806. It is thought that Clark's use of "Janey" derived from "jane," colloquial army slang for "girl." ^ "Sergeant Sacagawea". lewisandclarktrail.com. 2009-01-04. Retrieved 2012-02-13. ^ a b "Sacagawea". Lewis and Clark. Public Broadcasting Service. Retrieved 2017-09-12 – via PBS.org. ^ a b c d e f Anderson, Irving W. (Fall 1999). "The Sacagawea Mystique: Her Age, Name, Role and Final Destiny". Columbia Magazine. 13 (3). Archived from the original on February 11, 2008 – via washingtonhistory.org. ^ Lewis, Meriwether; Clark, William; et al. (1804). "November 4, 1804". The Journals of the Lewis and Clark Expedition. University of Nebraska–Lincoln. Retrieved 2012-12-22 – via unl.edu. ^ a b Lewis, Meriwether; Clark, William; et al. (1805). "August 17, 1805". The Journals of the Lewis and Clark Expedition. University of Nebraska–Lincoln. Retrieved 2012-12-22 – via unl.edu. ^ Lewis, Meriwether; Clark, William; et al. (1805). "November 20, 1805". The Journals of the Lewis and Clark Expedition. University of Nebraska–Lincoln. Archived from the original on February 2, 2008 – via unl.edu. ^ a b Hebard, Grace Raymond (1933). Sacajawea: Guide and Interpreter of Lewis and Clark (2012 ed.). Courier Corporation. ISBN 9780486146362. ^ Lewis, Meriwether; Clark, William; et al. (1805). "October 13, 1805". The Journals of the Lewis and Clark Expedition. University of Nebraska–Lincoln – via unl.edu. ^ Kastor, Peter; et al. "Sacagawea in primary sources". Lewis and Clark and the American Challenge. St. Louis: Department of American Cultural Studies, Washington University. Archived from the original on February 11, 2006. Retrieved 2008-06-21. ^ a b Drumm, Stella M., ed. (1920). Journal of a Fur-trading Expedition on the Upper Missouri: John Luttig, 1812–1813, St. Louis: Missouri Historical Society. ^ a b Butterfield, Bonnie. "Spirit Wind-Walker". Sacagawea: Captive, Indian Interpreter, Great American Legend: Her Life and Death. ^ a b c d e f g "Historical Landmarks". Sacagawea-Biography.org. ^ a b Wilson, Raymond (May 25, 1999). Ohiyesa: Charles Eastman, Santee Sioux. University of Illinois Press. ISBN 978-0-252-06851-5. ^ a b Clark, Ella E. & Edmonds, Margot (September 15, 1983). Sacagawea of the Lewis and Clark Expedition. University of California Press. ISBN 978-0-520-05060-0. ^ "Who's Buried in Sacagawea's Grave?". HISTORY.com. Retrieved 2018-03-03. ^ "University of Wyoming American Heritage Center". Ahc.uwyo.edu. Archived from the original on 2012-02-13. Retrieved 2012-02-13. ^ "Lewis and Clark Trail". Lewis and Clark Trail. 2001-01-17. Retrieved 2012-02-13. ^ Mickelson, Sandy. 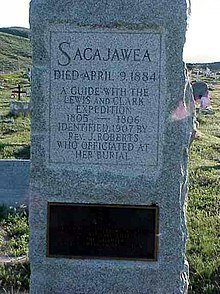 "Sacajawea legend may not be correct". The Messenger. Fort Dodge, Iowa. The reporter recounts the findings from Thomas H. Johnson, who argues in his "Also Called Sacajawea: Chief Woman's Stolen Identity" that Hebard had the wrong woman when she relied upon oral history that an old woman who died and is buried on the Wyoming Wind River Reservation was Sacajawea, the Shoshone woman who participated in the Lewis and Clark Expedition. ^ Scharff, Virginia (1989). Joncich Clifford, Geraldine, ed. "Grace Raymond Hebard: The Independent and Feminine Life; 1861–1936". Lone Voyagers: Academic Women in Coeducational Universities. 1870–1937. New York: The Feminist Press at the City University of New York. ^ Butterfield, Bonnie (November 28, 2011). "Sacagawea's Shoshone People". bonniebutterfield.com. Retrieved 2018-01-12. ^ a b Butterfield, Bonnie (1963-07-02). "What Happened After The Expedition: Sacagawea's Death". bonniebutterfield.com. Retrieved 2012-02-13. ^ Park, Indrek. 2012. A Grammar of Hidatsa. Ph.D. dissertation, Indiana University, Bloomington. p. 36. ^ Koontz, John (ed.). "Etymology". Siouan Languages. Retrieved 2007-04-01 – via spot.colorado.edu. ^ Bright, William (2004). Native American Place Names in the United States. Norman, Oklahoma: University of Oklahoma Press. p. 413. ^ Hartley, Alan H. (2002). "[Unknown]". Society for the Study of the Indigenous Languages of the Americas Newsletter. Society for the Study of the Indigenous Languages of the Americas. 20 (4): 12–13. ^ Reid, Russell (1986). Sakakawea: The Bird Woman. Bismarck, South Dakota: State Historical Society of North Dakota. Archived from the original on 2008-05-14. Retrieved 2007-12-12. ^ Matthews, Washington, ed. (1877). Ethnography and Philology of the Hidatsa Indians. Washington, DC: US Government Printing Office. ^ George, Rozina. "Agaidika Perspective on Sacajawea", Life Long Learning: The Lewis and Clark Rediscovery Project. ^ Place Settings. Brooklyn Museum. Retrieved on 2015-08-06. Also in: Overview of the concept by Kay Keys 2007. ^ ""The Girl Who Walked the West" on Death Valley Days". Internet Movie Data Base. November 4, 1967. Retrieved June 7, 2015. ^ Dye, Eva Emery (1902). The Conquest: The True Story of Lewis and Clark . ^ "Schoolhouse Rock 'Elbow Room'". Retrieved 2012-02-13 – via Youtube.com. ^ "Tingstad & Rumbel discography". tingstadrumbel.com. ^ "Alessandra Celetti: "Sketches of Sacagawea" (2010, Al-Kemi Lab)". distorsioni-it.blogspot.it. April 1, 2011. ^ "Episode 1: Sacajawea". The Broadsides – via itunes.apple.com. ^ "Sacajawea Interpretive, Cultural, and Educational Center". sacajaweacenter.org. Salmon, Idaho: Sacajawea Interpretive, Cultural & Educational Center, City of Salmon, Idaho. Archived from the original on 2012-02-18. Retrieved 2012-02-13. ^ "Clark's Point, Case Park". LewisandClarkTrail.com. 2008-06-29. Retrieved 2012-02-13. ^ "Sculpture of Sacagawea and Jean Baptiste". lclark.edu. Lewis & Clark College. 2004-09-05. Retrieved 2012-02-13. ^ "City of Richland Public Art Catalog". City of Richland. p. 19. Archived from the original on September 9, 2015. Retrieved October 12, 2015. ^ Weber, Harry. "'Late May 1805' diorama". nps.gov. US National Park Service. Wikimedia Commons has media related to Sacagawea.